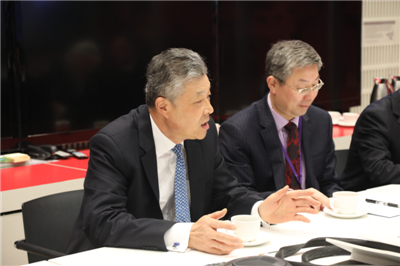 On April 3, 2019, Ambassador Liu Xiaoming held talks with senior editors and journalists at the BBC’s headquarter. Fran Unsworth, Director of News and Current Affairs and some 20 BBC senior editors and journalists attended the event. Minister Ma Hui and Minister Counsellor Zeng Rong, Spokesperson of the Chinese Embassy, were present. Ambassador Liu highlighted Xi Jinping Thought on Diplomacy, the outcomes of the Second Session of the 13th National People’s Congress of China and the Second Session of the 13th National Committee of the Chinese People’s Political Consultative Conference, and China’s achievements in economic and social development. He noted that under the leadership of the CPC Central Committee with Comrade Xi Jinping at the core, China is working conscientiously to realize its “Two Centennial Goals” and the Chinese dream of national rejuvenation. Although China is still the largest developing country in the world and problems of unbalanced and insufficient development remain, the Chinese people are confident in building China into a prosperous, strong, democratic, culturally advanced, harmonious and beautiful country by deepening reform and expanding opening up. Following the path of peaceful development, China is committed to building a new type of international relations and a community with a shared future for mankind and contributing to a beautiful world of lasting peace, universal security, common prosperity, openness, inclusiveness and cleanness. Ambassador Liu presented Xi Jinping: The Governance of China, Volume I and Volume II to Unsworth, expressing the hope that BBC editors and journalists would have a better understanding of the CPC, of China and of the Chinese people, reject the ideological prejudice, and report on China’s development in a more objective, justice, comprehensive and balanced way, which would inject positive energy to China-UK relations and their pragmatic cooperation in various fields. The Ambassador also answered questions on the Belt and Road Initiative, China-US trade negotiation, China-Africa cooperation, China-UK relations in the context of Brexit, China’s view on Brexit, climate change, the difference between China and western countries in political system, China’s future development, Huawei, Xinjiang vocational education and training centre, and the situation in the Korean Peninsula.